Austria-Hungary used four main types of fighter aircarft in WWI. The licence-built Albatros D.III, Hansa-Brandenburg D.I, Aviatik D.I and the Phonix D.I/II. It is with the third aircraft that this volume is concerned. The Aviatik D.I was designed by Julius Berg and is also known as the 'Berg' fighter. It was the first of the indigenous Austro-Hungarian fighters able to fight with the Allied aircraft on an even footing. However it did have a shortcoming in its weak wing structure often leading to inflight failure with disastrous consequences. It was due to this shortcoming that Oblt Frank Linke-Crawford was lost when his aircraft was damaged and unable to maneuver away from attacking Italian Hanriots. Despite this failing, the Berg was liked by its pilots for its maneuverability and ease of control. The book itself contains roughly 160 b/w photos as well as 17 colour photos of the two extant examples - one in Austria, the other in the USA. Text is very extensive and is in both Czech and English. Chapters are on design history, combat use, colours and markings. Additions include general arrangement drawings in 1/48 scale by Jan Zahalka and Jaroslv Farkas, 26 colour profiles by Zbynek Valka and Ing. Tomas Poruba of which I'm envious. 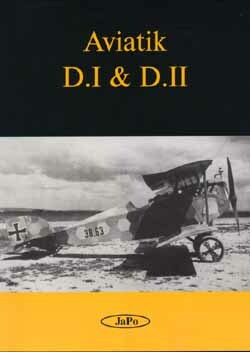 There is also a section on the D.II, a little known design with an interesting wing structure. The JaPO team have put together what is sure to be the main reference on the type - in fact, I was talking with another publisher about our working on a similar volume, which has now been shelved due to being redundant.